Disability-adjusted life years is the sum of years lived with disability (YLWD) and years of life lost (YLL) due to the disease. Granted, living with disease A for 10 years is likely to cause different suffering than disease B over the same time, but this gives us an idea. And the statistics are given in time per person across the population. Consequently if a disease causes lots of disability but is rare, it will have a lower number than another which causes less disability but is very common. The trend here toward neuropsychiatric disorders is clear. 2) Comparing the genders, it's unsurprising to see that women fare better than men. What's more, women's outcomes have improved more over the period 1990-2010, in conditions relating to behavioral risk-taking and impulse control - e.g., road injuries and drug use. 3) Embarrassingly, years per population lived with disability for schizophrenia, dysthymia nad bipolar are all essentially flat for this 20 year period. That's bad. That is not the case for most other major diseases. 4) The rise in death and disability over this period from addiction remains staggering. For added irony, a huge proportion (possibly the majority?) of this represents prescription drug abuse. This represents a major, major policy failure on the part of drug enforcement agencies - you know, the ones that have marijuana scheduled as more dangerous than synthetic opioids. The agencys' position must be: hey, people are suffering and dying, but it's a-okay as long as it's not from street drugs! Tramadol has been isolated from an African medicinal plant, Nauclea latifolia. Interesting because tramadol was synthesized first, then found to be present in nature (and a known medicinal plant) later. The rubeaceae family also contains coffee and Psychotria viridis (source of DMT in ayahuasca). Useful-to-humans chemistry seems to concentrate oddly in certain plant families, quite apart from any human eugenics; solaneacea is another good example. (Note that the compounds produced by these families are not chemically similar or necessarily the result of the same pathways - it seems like it's the abstract property of chemical utility to mammals that is shared within these families - which is why this is so unexpected.) Oddly, DMT was also synthesized before it was discovered in nature. The endowment effect is well-studied: people assign higher worths to their own possessions than to same things owned by someone else. That is to say: you wouldn't pay more than $30 for that couch on Craigslist, but when you list your own - same model, same condition - for some reason, you ask (and somehow, actually expect!) $75. To many of us there are two central features of cognitives biases that make them so interesting. The first is that they're cognitive biases, not cognitive stupidities. We aren't just all over the map due to limited brainpower, as bounded cognition models would suggest; we consistently make mistakes in the same "direction". This consistency (even if it's consistent incorrectness) leads to the other interesting aspect of cognitive biases, which is the extent to which they might actually be instrumentally rational shortcuts in disguise, either being seen out of context or profitable only over the long run. That is, perhaps when we were hunter-gatherers, they were useful. For example, hyperactive pattern detection (type I error) is a terrible thing in the modern age when we're looking for incoming nuclear warheads, but during the Pleistocene, we were stupid and it couldn't get us into too much trouble. Sure, maybe you might end up thinking the gods struck the mountain with lightning because your children cursed a lot that morning, and a thousand other strange things, but we couldn't really do too much about our strange beliefs anyway - but if that one time you saw a shape in the grass that looked like a hyena, and it really was a hyena - well, you still came out ahead. There's a lot in behavior and medicine like this that only makes sense in evolutionary context, for instance fever. Fever is not something that pathogens do to us, it's something that our bodies actively choose to do to them. In the modern age it's really hard for us to understand how fever can be beneficial, until we remember that merely two centuries ago when, without medicine, we could (and often did) die of fevers. But this is a kind of base-rate fallacy. Fever is a way our body shakes off pathogens, and before modern medicine, that cut in your foot might have a 70% chance of going septic and killing you. If the fever only has a 65% chance of killing you, you still come out ahead of any competitor who didn't have a fever response. So how could a completely judgment-clouding bias like endowment effect ever be helpful? Finding a group of people who don't appear to have it might point us in the right direction. And indeed, Apicella et al found that Hadza hunter-gatherers in contact with markets show the endowment effect just like the rest of us, but Hadza way out in the bush away from markets do not. This is pretty amazing - there's a difference in a known bias, even within the same group of people. So we've already learned one thing: the endowment effect is a learned behavior. So either we post-agricultural types are stupid, or we're getting something out of this bias. What's the benefit? And what exactly is different about the two groups of people that makes one group adopt this strategy? A simple model of markets assumes information symmetry between participants. But in reality, specialization of labor means that the person approaching you to buy your possessions will almost always have better information than the aproachee who's selling them, because the buyer buys (cars, computers, art, etc.) all the time - and if they're initiating the transaction, they are even MORE likely to have better information. Therefore, the endowment effect may be a learned behavior whereby we value our own possessions more highly than is justified on the open market as a defense against information asymmetry. Consequently, you can imagine the endowment effect as the cushion you need to come out even, when someone with better information than you buys your possessions, especially one who's initiating the deal. And returning to the Hadza hunter-gatherers, we may have identified the relevant difference. Hunter-gatherers are less specialized. If you're a hunter-gatherer, you know just about everybody you could possibly buy or trade something from, and there's not much special knowledge to allow information asymmetry - i.e., everyone is equally smart about the relative value of gazelles and axe heads - so there's no cause to develop such a bias. This theory makes several testable claims. 1) The more information asymmetry that exists between possession-owner/seller and the buyer, the more the endowment effect gap should be. You think your car is worth more when the car salesman runs up to you on the street initiating and offer to buy it, than when you're selling to someone online with apparently equal knowledge about cars. 2) The endowment effect gap should be larger in markets where there is poorer information, there is less trust, and for goods that are more difficult to value. Complex goods are more difficult to value. Not central to the theory, but relevant to the fact that this appears to be a learned behavior: children at some arbitrarily young age should not show the endowment effect, because if this differs between humans, it's learned behavior; kids haven't been swindled out of their possessions enough times. (And what is this arbitrarily young age?) Non-hunter-gatherers who nonetheless live in small groups of people with little interchange with other populations should lack this bias. Hunter-gatherers should develop this bias after they come into contact with markets. There is also a kind of Coasian consideration separate from the theory. Yes, you might have just gotten a good deal for your used Toyota, but now you have a Nissan and there's a utility cost to you of learning how to operate a new car. If that's ALL the endowment effect is, then each individual's ability to learn new behaviors should completely predict the entire strength of the endowment effect in each individual, at least with complex things like cars. Trolley problems are moral exercises (or experiments) where participants are asked to choose between horrible choices, to see how our moral reasoning works. For instance: do you push one person onto the tracks of an out of control trolley to keep five people further away from getting run over? Or do you just not say anything if you see a single careless person wandering into the trolley's path of his own accord, to keep those five people safe? Among other interesting observations in these experiments, we are inconsistent, and people who claim vastly differing moral foundations (religious and atheists, for example) tend to choose the same answer, as long as they're otherwise from the same cultural background (e.g., they're both American). Some enterprises already exist attempting to "solve" morality, that is to be able to program it into a computer, partly motivated by a belief in the impending technological singularity. Trolley problems are criticized as being able to give us a window into actual moral reasoning for some of the same reasons same reasons as any consequence-less self-report method. But literal trolley problems are now becoming consequential, now that we have driverless cars. Their engineers have to encode how these cars will decide who to hit, if they find themselves in a situation where they have to hit someone. If they have a choie between a helmeted and non-helmeted cyclist, shouldn't they aim for the helmeted cyclist to minimize harm? If only things were as simple as Asimov's Three Laws of Robotics. Sam Harris has written a book attacking the concept of free will, and in so doing has already received wince-inducing slams from philosophers, notable among them Patricia Churchland's. Stung from this, Harris sought out another philosophical foe (although another of the Four Horsemen), one of the most famous living philosophers, Daniel Dennett. Where Churchland's comments only implied that she didn't think Harris's arguments were worth an extended response, Dennett's directly states as much. It's a fun read. Nonetheless, it remains an interesting problem (I suspect because it's foundering on submerged bad assumptions), like the nature of consciousness, which is why I'm writing this blog post and you're reading it. So first, briefly, here are three points that no-free-will incompatibilists should better address or answer. 1. Our current understanding of morality and individual responsibility is destroyed by the removal of free will. As Dennett points out, this is not an argument for free will; if there's no free will, then we lose morality, and too bad for us. But to say that no-free-will incompatibilists like Harris do not give this point enough time given its importance would be too kind. 2. If there is no free will, then all of causality is an illusion as well. Why? Because every event has in some sense "already happened" (was set in motion at the Big Bang), or it's unknowable noise. That is to say, we're watching a movie, and what happens at 1 hour 12 minutes in was determined when the film was recorded, and it's not going to change, and the image of the man kicking the soccer ball doesn't cause the image of the soccer ball to move any more than anything else on the film. As with the observation about morality above, this also does not make an argument against no-free-will incompatibilism. But the problem with causality does follow directly from this position, and it's ignored by said incompatibilists, and has profound implications for epistemology and the scientific method. 3. If there is no free will, how can there be a "now"? If everything is caused and determined, then we're in a frozen block of space-time or a movie. A subjective sense of free will is certainly not an argument for free will. But it is very difficult to understand how there could be a sense of a present moment if there is no such thing as the present moment - that is, of a changing point in time that is asymmetric and special because it seems to be influencing other points in time, that cannot in turn influence it. 4. Libet's button-pushing experiment disproves only one fragile model of free will (though Dennett doesn't bring it up in his review). An easy solution, though one that would support a free will that most of us would not like, is epiphenomenalism, where the decision is being made by an entity with free will whose process our conscious selves do not have access to. Certainly if free will exists in any entity on Earth, it's humans, and humans are having this argument - but even proving that humans have not a shred of free will is different than proving that the universe we're in does not allow it. Darwin was right (that saltation would disprove his theory) and Gould was wrong: half a wing IS better than no wing at all. If squirrels don't convince you, how about snakes? I'm just glad I won't be around in a few 10s of millions of years when these nasty characters can fly for real. Cross-posted to my sports and outdoors blog MDK10 Outside. New analysis of football stats at advancednflstats.com, from an expected utility standpoint, rather than just "yards gained". One yard from the 50 to the 49 yard line is not the same as one yard from 1 to the end zone. The article points out that even points expected is limited and must be considered when time is not a factor, since a team up by a single point will sacrifice the opportunity for more points just to run time off the clock, and avoid the small chance of turnovers. Of course the departures from rational optimization are the most interesting, but they don't get into that (yet). A lot of those apparent deviations from rationality may in fact be maximizing something besides win-loss records. Professional football is a commercial endeavor and isn't played in a vacuum, and contra Lombardi, winning isn't the only thing. Profit is. 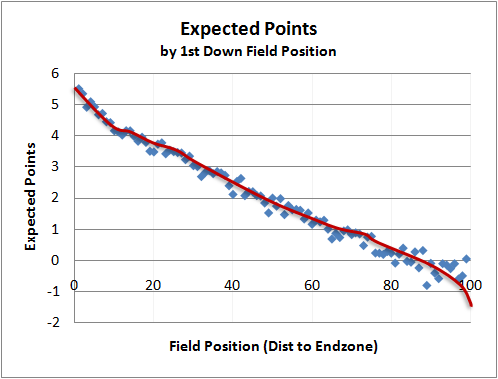 shape of the curve, which is why expected points is not the same as yards gained. Cambrian Explosion Caused by Carnivores Caused by Oxygen? That's the explanation advanced by a team from Scripps in La Jolla, Harvard and Andhra University in India. This is different than the great oxygenation event, which occurred much earlier. The argument is that consistently high oxygen levels in the oceans (where basically, everything interesting still lived at that time) allowed the development of more and more diverse carnivore strategies and therefore body plans. Learn more here. If this makes you laugh out loud you are an enormous nerd. Steven Hsu blogs a 2012 paper by John Ioannidis, the meta-analysis and replication guru who has become famous by identifying the statistical skeleton's in medicine's closet. Improving this is critical not only for medical science's ability to get results, but also in terms of science's credibility in the eyes of the public. This latter consideration has never been so critically important as now. ...self-correction does not always happen to scientific evidence by default....History suggests that major catastrophes in scientific credibility are unfortunately possible...Careful evaluation of the current status of credibility of various scientific fields is important in order to understand any credibility deficits and how one could obtain and establish more trustworthy results. Efficient and unbiased replication mechanisms are essential for maintaining high levels of scientific credibility...In the absence of replication efforts, one is left with unconfirmed (genuine) discoveries and unchallenged fallacies. In several fields of investigation, including many areas of psychological science, perpetuated and unchallenged fallacies may comprise the majority of the circulating evidence. Ioannidis, J.P. Why Science Is Not Necessarily Self-Correcting. Perspectives on Psychological Science November 2012 vol. 7 no. 6 645-654.